Finding Creative Solutions to Complex Legal Problems Based in San Francisco, California, Michael B. Bassi, a Law Corporation, has been providing exceptional legal representation in estate, trust, and probate disputes, serious personal injury, and general civil litigation matters to clients throughout the Bay Area and Northern California since 1980. For further information about our areas of expertise, please see our San Francisco estate planning & trusts laws practice areas page. Our attorneys are creative legal thinkers, adept at devising innovative case strategies and carrying them through with successful results. We have a reputation in the legal community for obtaining excellent outcomes in difficult and challenging cases, including cases involving financial elder abuse, severe body and brain injuries, and cases addressing novel areas of law. In recognition of our firm's excellent legal representation, the firm and its principal, Michael B. Bassi, have earned the prestigious "AV" peer review rating from Martindale Hubbell, signifying the highest standards of ethical and legal ability. We are a small, premier San Francisco probate & estate planning law firm, where client service is our first priority. Our lawyers are responsive and keep clients informed of the status of their cases. In fact, most of our clients come to us by referral from other attorneys and past clients. Our San Francisco Probate & Estate Litigation, Estate Planning and Administration, Personal Injury, and Civil Litigation Practice Our attorneys focus on the following legal areas: Estate, Trust and Probate Litigation: Even with careful planning, disputes are common relative to the provisions of a will or trust. 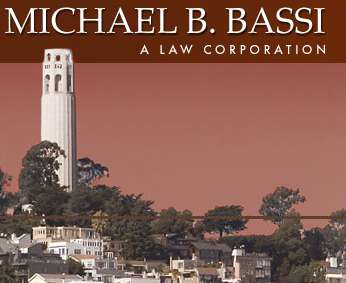 The San Francisco estate planning attorneys at Michael B. Bassi, A Law Corporation have extensive experience in will litigation and trust litigation representing beneficiaries and fiduciaries. Trust and Probate Estate Administration: We advise trustees in the administration of trusts including situations where disputes arise with beneficiaries or co-trustees. We are also skilled at handling all aspects of the probate process, including representing executors and administrators when probate disputes or trust disputes arise. Serious personal injury: Our firm has over 25 years of experience representing victims of accidents involving serious injuries in San Francisco. We understand the complex medical issues and California laws involved when someone is seriously injured or killed as the result of the negligence of someone else. We provide personalized, responsive representation for every case General civil litigation: We handle all aspects of litigation pertaining to a variety of business and real estate matters. Our attorneys have litigation experience in California and federal courts, and even before the United States Supreme Court Wills: A San Francisco wills lawyer can explain the difference between life in the 20th century and life in the 21st century in terms of how your estate will be left once. More rights are available to a person signing a living will after October 1, 1999, and a person needs the newer living will in case he or she ends up in an "end stage condition." You need a San Francisco living trust lawyer, so that assets you haven't conveyed won't become subject to probate. The personal representative in charge of the probate is entitled to receive compensation from the estate assets for his or her services. For over 25 years, Michael B. Bassi, A Law Corporation, has been representing victims of serious injuries and wrongful deaths in a range of personal injury matters. The firm's attorneys also have significant experience in representing families who have lost a loved one in wrongful death actions. Our attorneys have over 25 years of experience successfully representing victims of serious injuries, and have extensive experience in interpreting and evaluating medical records. We are also skilled at reviewing and understanding medical records and working with expert medical professionals. We understand the complicated medical facts that form the foundation of serious personal injury and wrongful death claims. Firm principal Michael B. Bassi has over 30 years of experience practicing law in the San Francisco Bay Area and Northern California. Mike is both an accomplished trial attorney and a skilled negotiator, and has tried over 70 cases to judgment, including over 40 jury trials to verdict, successfully obtaining multiple seven-figure and high six-figure settlements. In recognition of Mike's established reputation for providing exceptional legal services, he has earned the prestigious "AV" peer review rating from Martindale Hubbell, signifying the highest standards of ethical and legal ability. For the past ten years, an increasing amount of Mike's practice has centered on will contests and other probate and trust litigation, although he continues to handle a wide range of complex civil litigation, real estate litigation and transactions, wills in San Francisco and select catastrophic personal injury cases. Please see our representative cases page for examples of Mike's successes. Mike handles all phases of litigation, including discovery, settlement and appeals, and has significant state and federal appellate court experience, including an appearance before the United States Supreme Court. Mike also serves as a Judge Pro Tempore of the San Francisco Superior Court, and is a licensed California Real Estate Broker.